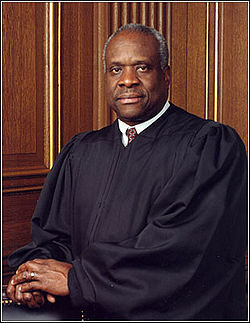 The number-one Conservative of the Decade is Clarence Thomas, Justice of the Supreme Court since 1992. Conservapedia contributors cite him for his opinions clarifying the Establishment Clause of the U.S. Constitution, and holding that capital punishment is not "cruel or unusual" within the actual meaning of the Eighth Amendment. “ Thomas is a distinguished jurist who understands that the Constitution is not a Ouija board, plus he can relate to Americans (RVing, raising a twelve year old grandson). His silence at oral arguments indicates that he is more interested in what the people are saying, and he is a quiet force behind the scenes. For ten years he has withstood intense pressure to become more liberal in order to win the media accolades given to less accomplished men. With sincerity, insight, and good spirit, Justice Thomas has become an inspiration for a generation of Americans at a time when there appears to be few role models in public life. His autobiography, published in 2007, traces his path from the most humble roots to the pinnacle of power, and yet he never flinched from his principles as so many others in Washington do. Justice Thomas wrote 80 decisions for the Court in this decade, and there is not a misstep in any of them. He is the Conservative of the Decade! The immediate runners-up to Thomas were those who propounded, supported, voted for, and defended California's Proposition 8, the proposition declaring that California's constitution would recognize marriage as between one man and one woman, and not dignify any other combination (man and man, woman and woman, man and animal, etc.) with the term "marriage." Proposition 8 set the so-called "homosexual agenda" back considerably, especially since at last Californians managed to so amend their Constitution and not have California's courts invalidate that amendment. 1. Charlton Heston, who famously said, "Cold dead hands" in support of the Second Amendment. 2. Jerry Falwell, founder of Liberty University. 3. Ronald Reagan, American Patriot and the 40th President of the United States. 4. Karol Cardinal Wojtyla, better known to history as Pope John Paul II. This page was last modified on 28 January 2015, at 23:24.